It’s the small pieces that make the big picture, and in this case, the pieces can’t be seen by the naked eye. New research at the Okinawa Institute of Science and Technology Graduate University (OIST) used microscopy techniques to piece together the brain of the millimeter-long Caenorhabditis elegans, revealing that their neurons fire action potentials — a spike in voltage due to neurons sending sensory information in the cell membrane. Their results could lead to better understanding of how nerve signals are transmitted in the organism and serve as a future model for neuronal information processing in other animals, including humans. Scientists from the Information Processing Biology Unit (IPBU) and the Neurobiology Research Unit (NRU) at OIST collaborated on the project. 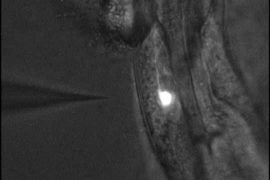 The IPBU had the technology to genetically modify C. elegans, while the NRU had the know-how to record electrical signals from the worm’s tiny neurons. Although generally thought to lack the ability to fire action potentials — the all-or-none pulses needed for decision-making — Prof. Ichiro Maruyama, principal investigator of the IPBU, had results that suggested the worm’s neurons did fire action potentials. To confirm his suspicions, he wanted further data using electrophysiology, which his lab was not actively doing, so he shared his ideas with Prof. Jeff Wickens, head of the NRU and researchers Tomomi and Mayumi Shindou. Seven years later, the collaboration paid off; the completed study was published in Scientific Reports on March 5, 2019. Before the project, the common perception was that C. elegans neurons only responded in a graded way with analog signals. The work showed, however, that the neurons would fire an action potential if they crossed a threshold, a more digital type of signaling. To observe sensory processing in C. elegans, Maruyama and his team applied salt to the tip of the worm’s nose. They increased and decreased the salt concentration, seeking different reactions from the worm and monitoring the electroactivity of its neurons. They found that an increase in salt first affected a neuron on the left side of the brain, then triggered signals causing the worm to move forward. A decrease caused a neuron on the right side to send signals for the worm to move backwards. Researching C. elegans imposes a challenge — to give perspective on how small the brain of C. elegans is they have 302 neurons, an ant has 250,000 and a mouse has 75 million. Wickens put his former postdoc and first author of the paper, Dr. Tomomi Shindou, in charge of developing the methodology for the project. The work took time — four years of trial and error to create the right techniques, and three more for collecting data. The NRU created a sharp glass needle less than the size of a micrometer. They used the needle to extract a brain cell from C. elegans once it was exposed to salt to view the neuron. This method is like using tweezers to extract a splinter from a finger. «Only a handful of labs in the world can do this,» Maruyama said. «Once the cell was extracted, the scientists used electrophysiology — measuring voltage change in cells to track neurons viewing active and passive activation. The scientists also used calcium imaging to produce more data, and observed freely-moving worms that had been exposed to the salt. «Perfectly matched data» is a phrase every researcher hopes to hear. The results suggest that the accepted dogma—that these worms only send passive signals—is wrong. The remarkable finding also opens a door to improved neural mapping in the future.